Things take a turn for the worse! Having evil doppelgangers seems to be a recurring problem of Ence’s. 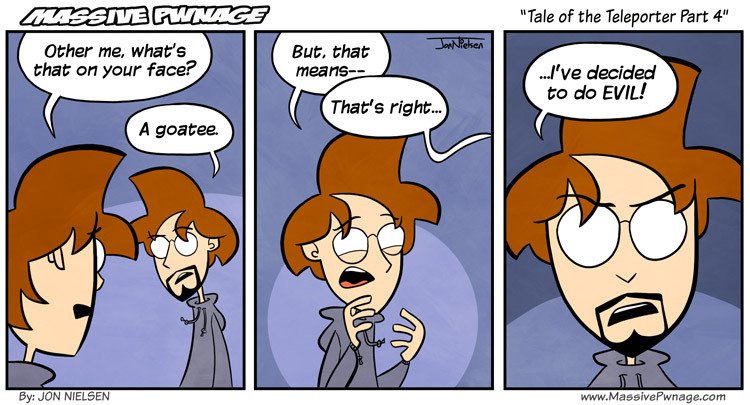 This entry was posted on Friday, June 3rd, 2011 at 12:00 am and is filed under Comics. You can follow any responses to this entry through the RSS 2.0 feed. Both comments and pings are currently closed. Clearly this is the original ence openly turning to evil. It is only the next logical step after disposing of and replacing Locke. I wonder what evil things the evil Ence will do? He stole cookies from the cookie jar. Or something just as bad. Why is every goatee clone evil? Star Trek made that possible. Goatee’s are pretty cool though, why can’t the good guy ever have the goatee? Soooooo saw this coming. Traditional clone goes evil with a goatee. In all honesty if he didn’t go evil I’d be really surprised. Now I foresee another amazing battle arc and Locke and Ence teaming up to do the fusion dance once again! So…. Did he dye his goatee black, or does Ence normally dye his hair red? plus, all good evil doppelgangers have black goatees. So since this ence is evil and all he needs to team up with the original ence’s enemies….. RETURN OF THE FISH PEOPLE!!!! Talking about Ence’s hair…. why is he bald in that werid line that gets to his back of his head?